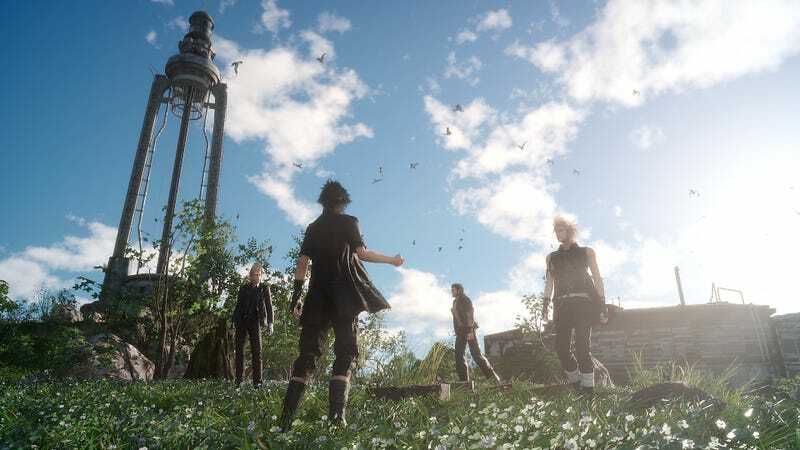 It’s no big secret that Final Fantasy XV’s director Hajime Tabata wants to put the game on PC. One of the big things he wanted to do with a PC version was crank the graphics up as far as he could and present the definitive Final Fantasy XV experience. There has been no official word as to whether or not a PC version will ever see the light of day, but sales are apparently really good which makes a PC version, or at least the beefed up version, far more likely to happen in the future. As was said in that second video(And I apologize about the quality, I don’t think there was ever an official video, just the stream recordings. ), the Witch Chapter 0 tech demo used 8K textures on everything, with every strand of hair rendered out, everything had physics of some kind, there’s subsurface scattering applied and advanced shaders, and up to 63 million polygons in that scene because DX12 allows for that. To give you an idea of how big 8K textures are, most Xbox One and PS4 games use textures between 1K(1024x1024) to 4K(4096x4096), with 2K(2048x2048) typically being the most common size as it isn’t as heavy as 4K textures. And to clarify becuase I’ve met many people who didn’t understand the difference, texture resolution has nothing to do with screen resolution. Those are two separate things. You don’t need a 4K monitor to use 4K textures, it doesn’t work like that. Granted, using a 4K monitor or TV would really bring out all the minute details that can be crammed into a 4K texture because of the clarity, but it isn’t a requirement. I use 4K texture mods for Skyrim and I can see the extra detail just fine on my 1080p screen. But anyway, knowing that console games, at maximum, use 4K textures(And that isn’t quite so common because typically 4K textures are PC ultra settings.) you can guess just how big 8K textures are. Most graphics mods for games like Skyrim and Fallout 4 don’t even touch 8K texture resolutions because it’s just so memory hungry. It’s big, probably the biggest texture that will ever be needed, and that tech demo was running on four 980ti’s(Might have been Titan’s though.) if I recall correctly just to get that scene running at a stable framerate because it needed that much power. That is what Final Fantasy XV’s Luminous Studio Engine is capable of achieving when not shackled to consoles, and the fact that the latest test environment is using only two 1080's to crank the settings all the way up to max, means that we’re making good progress towards rendering this heavy of a scene at a reduced cost, and that isn’t taking optimization into account. If the PC version of Final Fantasy XV is ever released, prepare to be floored by just how different it’ll look.